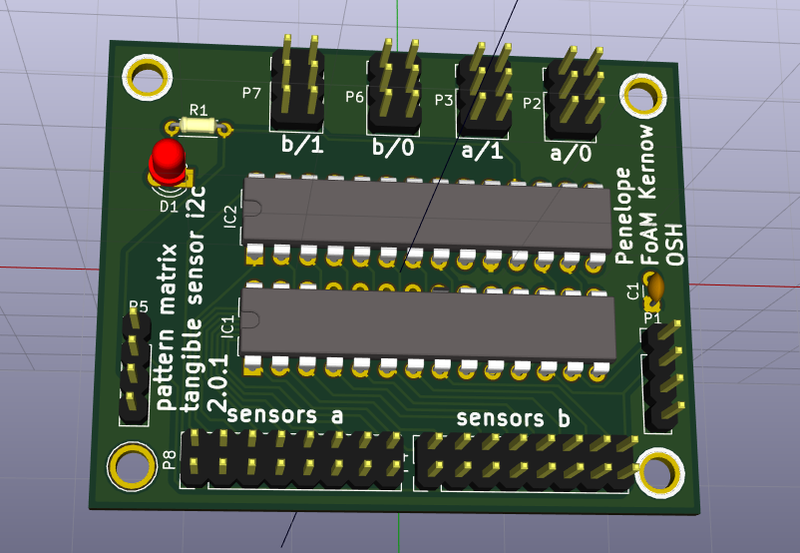 This is the pattern matrix 2 tangible sensor schematic, which is fairly simple – just 4 hall effect sensors and a capacitor to smooth out any noise on the power supply. 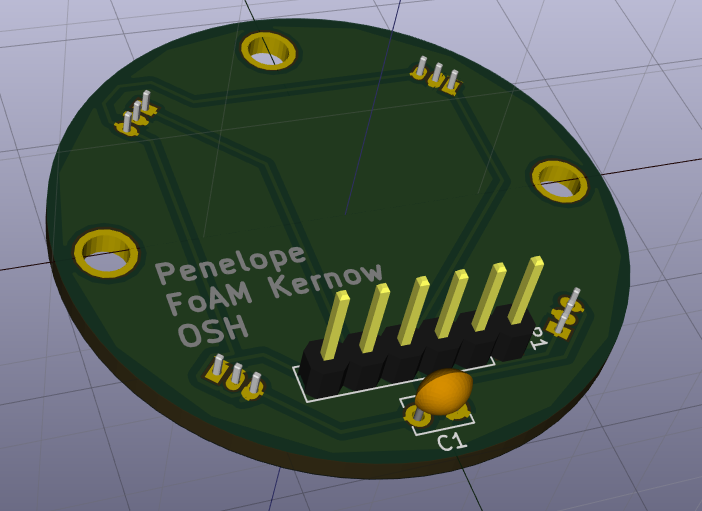 We need to make hundreds of these for the Penelope Project, and we can save some costs by using the built in pull up resistors in the MCP32017 to get a decent signal from the sensors. The difficulty with this PCB is arranging the sensors so they align with the magnets in the tangible programming block in the optimum manner. From tests with the prototype Lego rig, this isn’t actually too critical – but it’s set up so the lead length can be tweaked a bit at soldering time. This took me about 20 variations to finally get right, but the circuit is just about simple enough that it can be made single sided – this is good because the top side will be partly exposed, while the lower side with all the copper traces can be protected. It’s good practice to have large areas of copper left connected to ground, partly as it’s a common connection needed all over the board, partly for stability but also it reduces the amount of chemicals required to etch the circuit – as only the parts around the traces need to be removed. 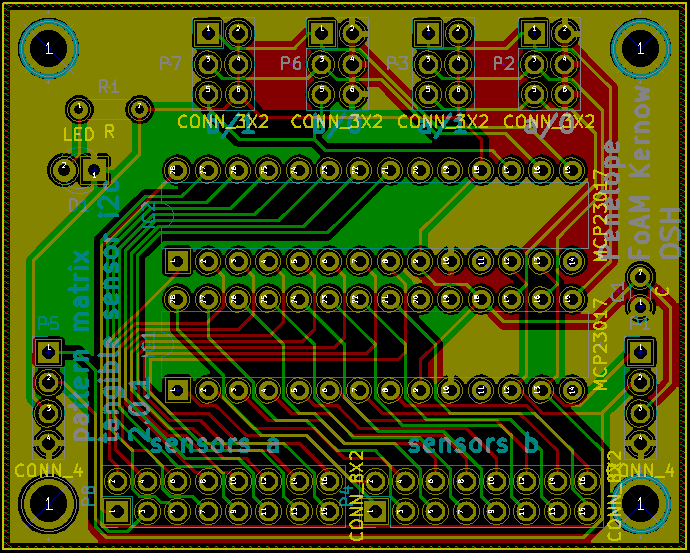 The i2c expander board is a little more complicated. 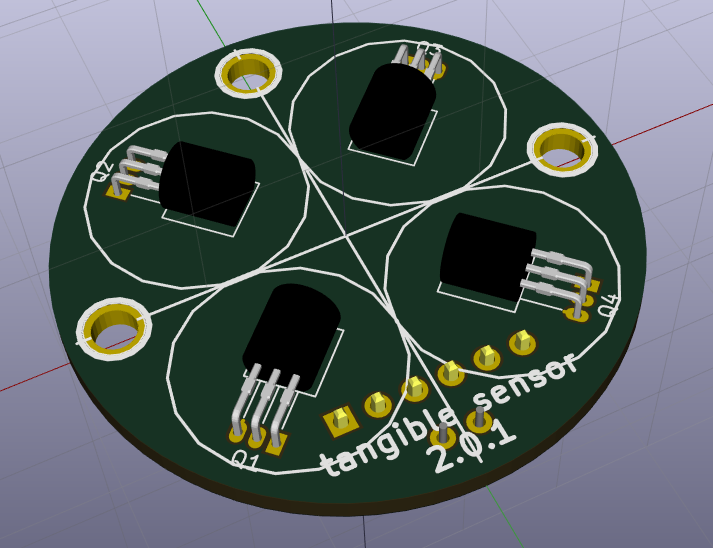 The design is made to be modular so we can stack up any number of these connected to the Raspberry Pi for different arrangements of sensors. Each board can deal with 8 sensor locations (each comprising 4 individual hall effect sensors). Their job is to convert the digital signals from each sensor into serial data (using the i2c protocol) so the Raspberry Pi can read them all just using 2 wires, plus 2 for power. Each board can be configured to a separate i2c device address to tell it apart from the others using jumper connectors. This one had to be 2 sided, but I managed it without any ‘vias’ (holes to pass traces from one side of the board to another). I also added a power indicator LED as a last minute addition. I’ve been learning the open source Kicad software to design these, which is now used by CERN for building the LHC, so it’s pretty fully featured! The idea is that you draw the schematic first, link each component with a physical ‘footprint’, then switch to the PCB design stage. Other software I’ve used in the past tries to route everything in one go for you (and can come up with some pretty strange and messy results). Kicad works in a semi-automatic manner – you need to draw each trace by hand, but it routes them around components and other traces, and suggests the shortest path for you. This is quite a lot better than a fully automatic approach as you have more control over the end result, and easily end up with a decent placement of all the parts. This project is of course open hardware, and can be found on github here.